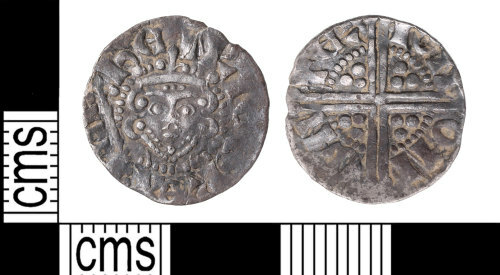 A Medieval silver voided long cross penny of Henry III (1216-1272), minted by Ioh at Canterbury, Class 5c2, 1251-1272. North (1994, 221) nos. 993. Measurements: 17.59mm in diameter, 0.89mm thick 1.36g in weight. Reverse description: Voided long cross dividing legend three pellets in each angle. A Medieval silver long cross penny of Henry III (1216-1272). Class 5c, 1251-1272, minted by Robert at Canterbury (North 1994: 227, ref: 993).